White and red believe Christmas badge with festive white text surrounded by green sprigs of holly and ivy on a white background. 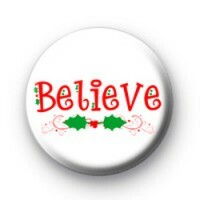 A super festive Xmas believe badge, perfect to hand out to your class at school during the Christmas period. We have a huge range of Xmas badges available on the website. Standard 25mm believe button badge made by hand in our Uk workshop.